Life of An Amateur Cyclist: Which Muscles Are Used When Riding A Bike? Many people are not aware of which legmuscles are used when they are riding their bikes. On the diagram below, made out from a scientific test, it is possible to take a much closer look on it. The pedal stroke is representing the right leg, so the pedals are going clockwise, just as the arrows shows. 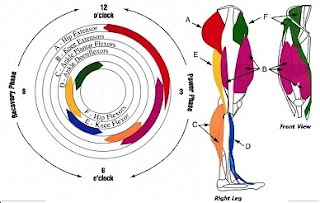 If we start at the “dead spot” on top, at 12 o’clock and go to to 3, the hip extensor (red) is doing most of the work. From 3 to 6 o’clock, the knee extensors (purple), takes the biggest load of work, but just before 6 o’clock, the ankle plantar flexors (skin colour) takes over. After we hit the “dead spot” at 6 o’clock, the ankle dorsiflexors (blue) is doing the biggest load of the work, before the hip flexors (yellow) is doing the most of the work at around 9. From 9 to 12 o’clock, the knee flexor takes over the biggest load of the work from the knee flexors. This means, that if you are using clipless pedals (like Shimano SPD or Look Keo) you are training the ankle dorsiflexors, the knee flexor, and the hip flexors a lot more efficiently, than if you used standard pedals.